The father of 11-year-old Abdul Rahman Nofal contacted me, asking for help. His son was shot in the leg during Gaza’s “Great March of Return” protests. The Strip’s dilapidated health care system could not save the little boy’s leg, as it was later amputated. His father, Yamen, himself a young man from the Buraij Refugee Camp in central Gaza, only wants his child to receive a prosthetic leg so that he can walk to school. The Israelis are refusing the boy a permit to cross into Ramallah to receive treatment. Desperate, Yamen composed a video, where he pleads with Palestinian Authority President Mahmoud Abbas to help his son. So far, his pleas have gone unanswered. Why is an 83-year-old leader so keen on engaging Israel through the so-called security coordination and yet so insistent on isolating and punishing his own people in the Gaza Strip? Starting on May 14, when thousands of Palestinians in Gaza went out to the fence separating the imprisoned enclave from Israel, Abbas’ supporters in the West Bank understood the “March of Return” protests as a validation of Fatah’s rival, Hamas. So they, too, took to the streets in “celebration” of Abbas’ imaginary achievements. Hundreds of Palestinians in Gaza were killed and thousands more wounded in the ongoing “March of Return”, many of them children; but Abbas and his Fatah allies were far more interested in ensuring their own relevance rather than joining the protests in demanding an end to the Gaza blockade. When much larger rallies were held in Ramallah and elsewhere in the West Bank calling on Abbas to end his punishment of the Gaza Strip, they were attacked by Abbas’ security goons. Men and women were beaten up and many were arrested for solidarity with Gaza, now an unforgivable act. However, Abbas still wants to convince Palestinians that he is resisting, not the type of “useless resistance” displayed by Gazans, but his own style of “peaceful civil resistance” of Palestinian villages in the West Bank. 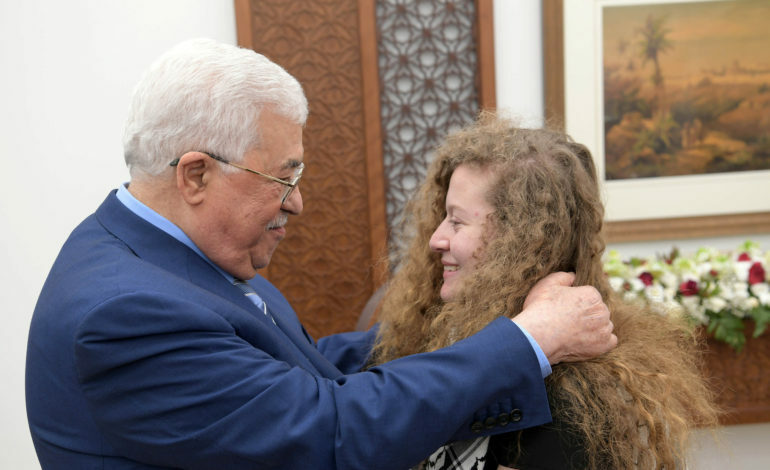 As soon as Palestinian teenage protester Ahed Tamimi was released from an Israeli prison after spending eight months in jail for slapping an Israeli soldier, Abbas was ready to host her and her family. If Abbas truly cared for Palestinian children and agonized over the pain of Palestinian prisoners — as he claims he does — why, then, worsen the plight of Gaza children and punish the families of Palestinian prisoners? The same can be said of Pakistani activist Malala Yousafzai, who was shot in the head by Taliban militants at the age of 14. The West’s exploitation of her struggle to recover from her wounds and breach peace and justice for her people is unfortunate. In Western psyche, Malala’s struggle is often, if not always, used to highlight the dangers of so-called radical Islam and to further validate U.S.-Western military intervention in Afghanistan and Pakistan. This issue was addressed firmly by Ahed’s mother, Nariman, who was also imprisoned in an Israeli jail and released eight months later. Nariman bravely spoke of the racist notions that made Ahed popular in Western media. With this in mind, it is important that Ahed Tamimi is not turned into another Malala, where her “peaceful resistance'” is used to condemn Gaza’s ongoing resistance; and where the fascination with her blonde, uncovered hair drowns the cries of the thousands of Ahed Tamimis throughout besieged Gaza, in fact throughout Palestine.